Files in Memsource can either be split or joined. Splitting files can be useful, especially when you need more than one Linguist to translate a file at the same time. This has no effect on the resulting completed target file, but it does let each Linguist get their own "virtual" file to work on. Once the Split feature is used, it cannot be undone. However, it is possible to view all the files together in the Editors by using the Join feature. Joining files can also be done when you have several small jobs with the same target and source languages that you want to open at once. The jobs will all be opened together in either the desktop or the web Editor. Please note that opening a large number of files at one time can have a negative impact on performance or cause difficulties with loading all files. To avoid problems, it is recommended that you do not join more than 100 files or more than 40,000 segments. Step 1: In your Memsource project, select the files you want to join (the files must have the same target language). 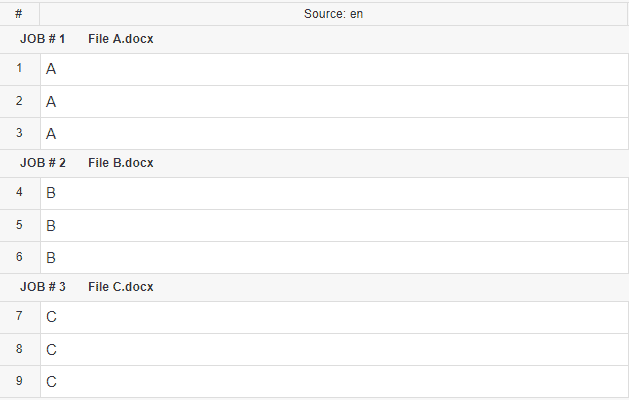 Step 2: Click on the Download button, and select one of the bilingual file formats (e.g. Bilingual MXLIFF) in the submenu. Step 3: Make sure Join files is selected and then click on Download. Once you do this, a joined file will be downloaded to your desktop. You can work with the joined file just like any other Memsource bilingual file—there are no limitations. Each job will be separated by a bar which includes the job’s number and filename (as they appear in Memsource). Step 1: In a Memsource project, select the files you want to join (the files must have the same target language). Step 2: Click on one of the file names.